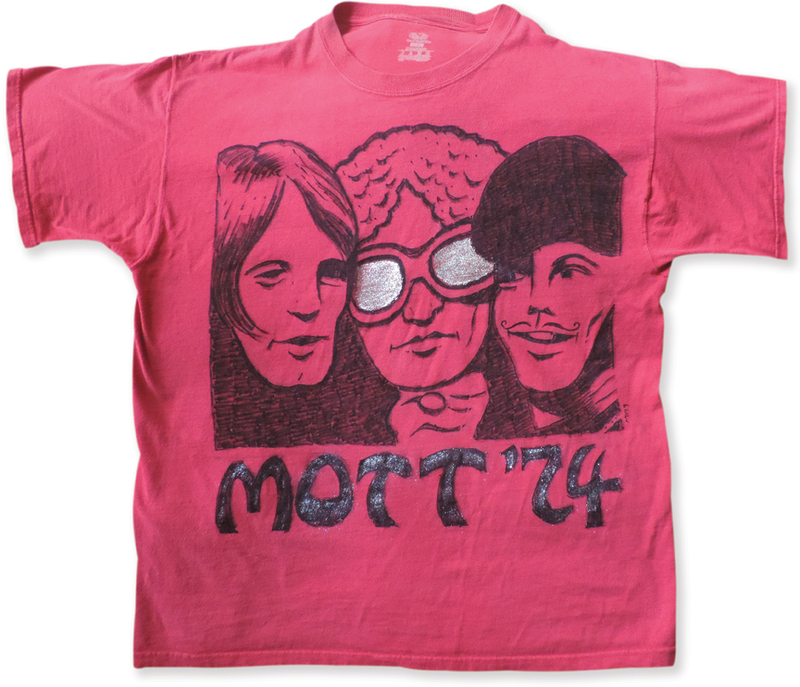 As both rabid readers of MarkVoger.com are aware, I’m super-psyched to see Mott the Hoople ’74 on April 8 at the historic Keswick Theatre in Glenside, Pa., where my mom once worked as an usher. Playing loud rock music live on stage will be the surviving members of the lineup that recorded my favorite Mott studio album, “The Hoople,” and the only live album from the band’s heyday, “Mott the Hoople Live” (both 1974). They are: singer-guitarist Ian Hunter, 79; guitarist Ariel Bender (a.k.a. Luther Grosvenor), 72; and pianist Morgan Fisher, 69. Wow! 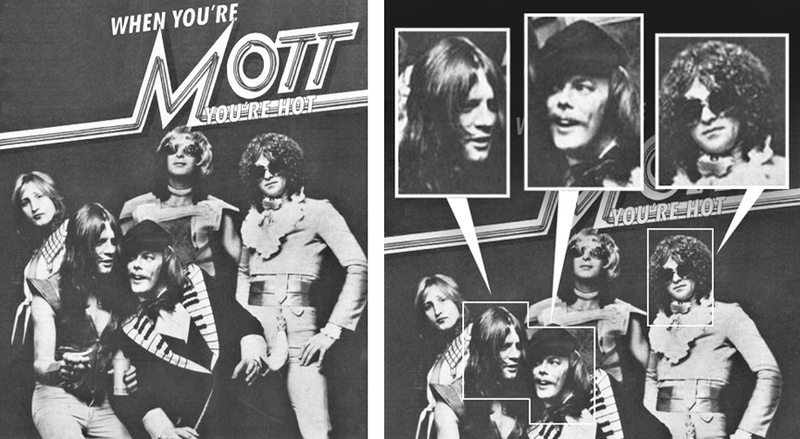 STEP 1: In the spirit of the occasion, I chose as my reference a 1974 advertisement with the ludicrous slogan, “When you’re Mott, you’re hot” (photo left). STEP 2: I zeroed in on the faces of the three musicians who will perform in Glenside (photo right). A moment of silence for the guys who won’t be there: bassist Peter “Overend” Watts and drummer Dale “Buffin” Griffin. STEP 3: I tightened up the trio’s heads; manipulated the image until it was starkly high-contrast; added the lettering; and placed the result within a nine-block grid (photo left). STEP 4: I then displayed the image on my laptop and stretched the T-shirt over my scuffed, old, college drawing board (photo right). STEP 5: I penciled the image using the grid as my guide (photo left). STEP 6: Once happy with the penciling, I inked the design using a “Chisel Tip”-type Sharpie, which gets a thicker line when desired (photo right). Step 6 continues in the photos above. Black areas were filled in the old-fashioned way: Crayola style. This was a throwback exercise. 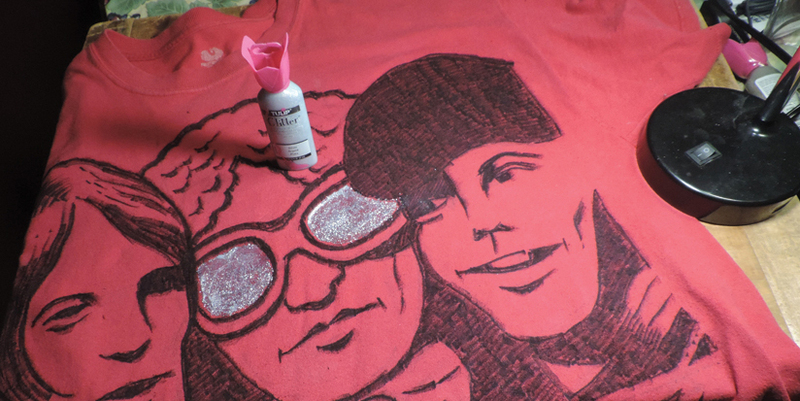 STEP 7: Glitter was then added to Ian Hunter’s specs using Tulip Glitter Dimensional Fabric Paint in silver, commandeered from a crafty friend. The product worked very well, despite the fact that it was more than 15 years old! The glitter is a nod to “glitter rock” — the very British, very ’70s sub-genre that brought us David Bowie, Roxy Music, T. Rex, Queen, Steve Harley and Cockney Rebel, and Mott. Here’s the finished shirt. Glitter was also added to the lettering, which I’d filled in with black, resulting in a different effect. Ian Hunter’s specs pop, while the glitter in the lettering picks up the light with a bit more subtlety. Given everything that marks my existence these days — I’m using understatement, if you can’t tell — drawing this shirt felt like fiddling while Rome burned. But it brought me happiness. Meanwhile, I’ve been listening to a lot of Mott. The live version of “Rose” destroys me. And Mott’s early, improbable cover of Melanie‘s flower-power masterpiece “Lay Down (Candles in the Rain)” plays in a veritable loop in my car … and my head … and my heart. Recently, there was another sign that the Glenside show is kismet. While doing research for Project X, I happened to find my old copy of the June 1974 issue of Circus magazine, which features Hunter and Bender on its cover and an illuminating story about “The Hoople” within. (I never knew Mick Ralphs, who quit Mott just before “The Hoople,” nevertheless attended all of the “Hoople” sessions in support of his old mates.) 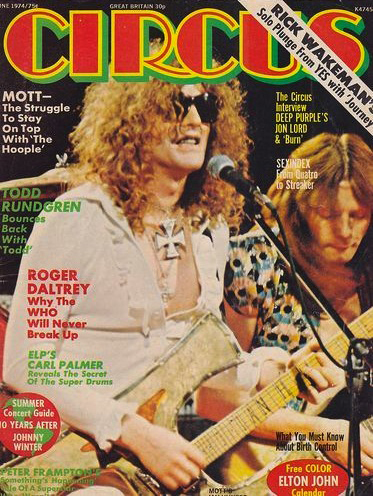 Ever since I found this Circus issue, it has lived on a stand in my office bookshelf, as if I need reminding that I’m going to see Mott the Hoople ’74. I just know I’m gonna bawl through the whole show. Fingers crossed that the band does “Rose.” I want to be completely destroyed. VIDEO: Here’s Mott doing “Rose” in Europe last summer. Fisher ends the song with a Dylan reference.